WOW! Thank you to everyone who has visited our Etsy shop and homepage today! 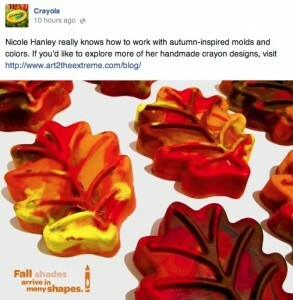 We were surprised and very humbled to receive love from the Crayola company today via their Facebook page! We were the first shop on Etsy.com to ever sell a recycled crayon over 8+ years ago and have expanded to over 175+ shapes and sizes of our Rainbow Crayons to date. We love seeing all of the fun creations our fans come up with, especially for Halloween treats, so feel free to share your creations and fun using Crayola products on our Facebook page. You can also enter to win a gift certificate to our Etsy shop to start off your holiday stocking stuffer lists! Our blog features segments such as “Artists and their Cats“, DIY projects, and humorous, handmade videos such as this one. You can learn more Art 2 the Extreme and our Rainbow Crayons HERE . As a thank you, we are offering FREE shipping if you use the code CRAYOLALOVE in our Etsy shop. Thank you for supporting an art teacher, mother, and artist!